Excitement, enthusiasm, fun, energy, entertainment and nourishment — all wrapped up in a meal in the meadow. It is very useful for people to know that each coyote and each dog react individualistically towards the other — Daren’s dogs show two reactions. 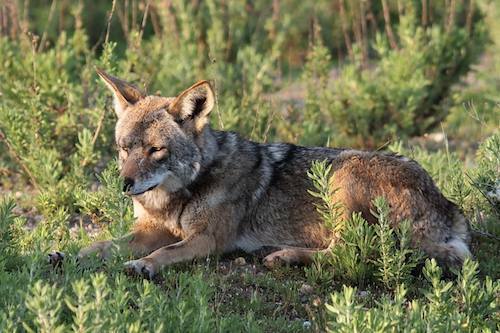 When coyotes approach a dog, they are probably being curious — assessing what is going on. It is best to scare them off as Daren does. That they approach from behind means they are being careful — this is their preferred method of approaching a dog, since the tail end of a dog doesn’t bite!! I have seen the coyotes in “my” canyon for the last fifteen years or so while walking my dogs. Only the last couple of years with my new dog have I had any issues and really the issue is that he is nuts, crazy for chasing them. My older dogs never cared much, we would see them lounging in the sun and all was good between us. My new dog however is quite different. I have begun to be more curious about them and have started taking pictures the last year of the canyon and all of the wildlife in it. It is not a park but instead a protected watershed area and very few people frequent it, only a few dog owners and mountain bikers. It has year round water and a lot of bird/rodent activity. The coyotes are present everyday and while I am unsure how many actually live there, I have seen up to 5 at one time but usually it is only 1 or 2 and they will usually pop up behind us or on a hill just above us. I have never seen one approach us from the front. They have come as close as fifty feet or so, I usually have to yell to get them to go off, they seem attracted to my dog, not me. My dog is a big 100lb sheppard-husky mix. On the nights or mornings when they start yipping and howling my dog will chime in with them. To me this is strange because he will not do it at any other time, not even when all of the other dogs in the neighborhood are howling, it is actually kinda cool to hear him. . . he thinks he is wolf. When I played the sound bites from your website he got up and got all antsy, looking up in the backyard for coyotes (sometimes they walk the small hill in our backyard). 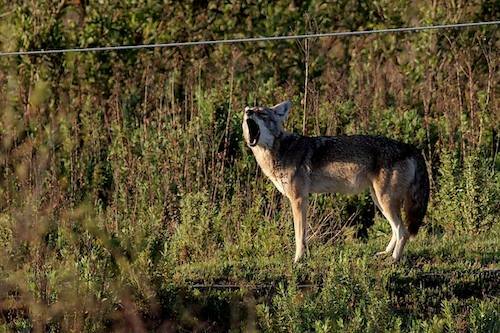 I have noticed in the last few months that one lone coyote will bark, bark, bark for awhile, and then many others start to join in and then they all start howling. Marc Bekoff, an animal behaviorist who has spent years studying coyotes, has written a couple of revealing short articles in the wake of sensationalist media hype: specifically on a recent National Geographic video which is based on a news item that occurred a year and a half ago and capitalizes on fears and sensationalism. 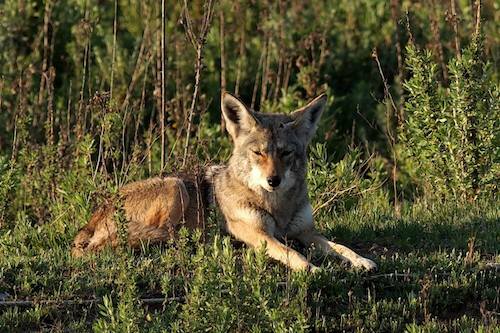 The incident reported is one of only two ever recorded deaths of humans by a coyote. The other incident involved a small child whose father had been feeding coyotes, which is what we suspect may have gone on in this case here. That these deaths occurred is very upsetting, but they are made that much worse by globalizing an incident that is so rare that we only have two recorded incidents of it in the last 500 years.This approach sells, but our respect for National Geographic, which produced the video, has fallen hard. Please see his article and the comments afterwards. 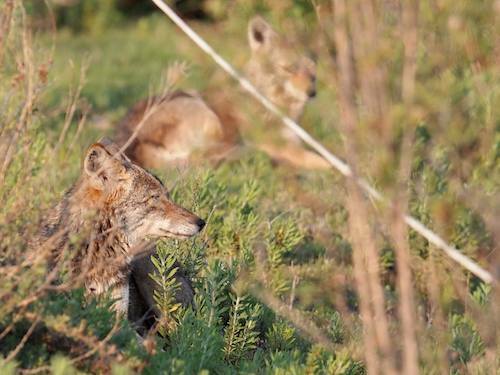 Coyotes Are Victims Of Their Own Success and Sensationalist Media. It had been 9 weeks since I saw Mom or Dad who live in a small field that borders one of Los Angeles County’s concrete ‘rivers’. At dusk today, Monday, I saw Mom. I stood partially concealed under a bridge in their field. I saw Mom on her routine walk back to her nest area. She hesitated when she noticed my leashed dog, Holtz, and me. She then quickly left. I had entered their field hoping to see them. I had failed to see any of them the last few times I visited. I’m curious to know if Dad has remained for this year’s breeding season. I also wonder if the two youngsters are still present in their field. 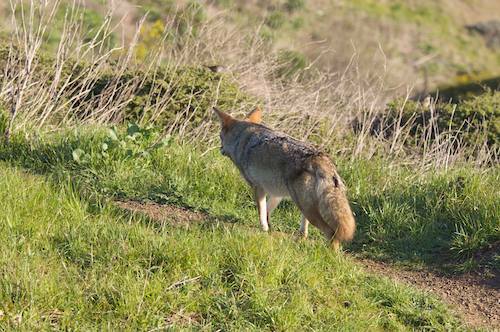 I ran into two coyotes Sunday in a field in north Orange County near Pacific Coast Highway. While walking in an area with good cover, I didn’t see the howler until it stood to answer a siren in the distance. The coyote seemed indifferent to my leashed dog, Holtz, and me. It laid down to rest after the siren passed into the distance. We moved closer and noticed a second coyote present. It appeared to be older and is marked by scars on its muzzle. I’m not sure if these two are mates. I can’t judge if the howler in the Siren picture is slightly swollen around the midriff. Of course, it is that time of year for coyotes. Both disappeared quietly into brush when I approached to about sixty feet. The PCH male’s scars are similar to those carried by the coyote I call Dad who, with his mate and two youngsters, live in a small inland field near a flood control channel – river. I wonder how typical such scarring is and whether more likely found on males than females. 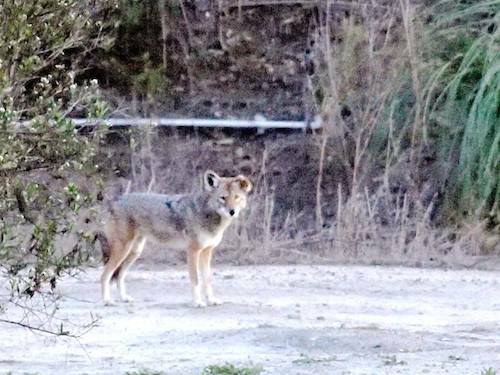 The PCH coyotes, before I arrived, were cavorting for a photographer in an open area near a well-used scenic, fenced walkway. My river coyotes are more secretive and I haven’t seen them for weeks.